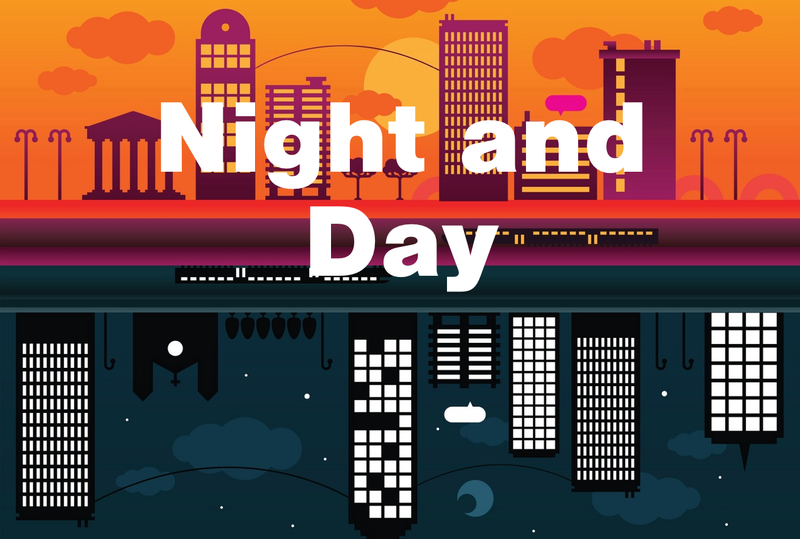 ‘Night and Day’ Reopens – Right On Your Desktop! The Night and Day collection is back in action, which means that all Club themes are now back online for members to start contributing to again – but this time with a bit of a difference. As 2011 has passed by and the collection has grown, I’ve already begun to think that The Sound Collectors’ Club needs to find a more suitable location to store it’s collections in than Soundcloud. Soundcloud is great aesthetically and perfect for linking to other social networks and blogs, and I’ll definitely continue to use it for the mp3 samples that can be auditioned in the Browse The Collection page. However, as a means of cloud storage for an ever-growing sound fx library, it isn’t ideal – the more themes we amass, the larger the amount of ‘secret links’ we’ll have to keep hold of and keep handy for whenever we want to access the collections. Downloading and then re-loading file metadata is also cumbersome via Soundcloud. What I feel we need is a form of cloud storage which more closely mirrors the way we store our own sound fx libraries on our work computers. In my opinion, the application that currently fulfills this brief the best is Sugarsync. There are many other similar applications but they all seem to fall down on one or more particular function that is essential for the Club to work well by this method. For example, Dropbox is great, but it requires everyone sharing a folder to have the capacity for the full size of the shared folder in their personal account, which is impractical. You can get around this by signing up for one of their Team accounts but that costs about £700 which is obviously far too expensive. With Sugarsync, only I need to buy the amount of storage needed to hold the Club’s collections. I can then share it with all contributors, who only need sign up for the free account. You will receive an e-mail from me saying that I’ve shared a folder with you; if you’ve already signed up to Sugarsync you can access it straight away. If not, you can click on the ‘Sign Up’ link on the e-mail and then let their website lead you through the registering process before returning to the e-mail to access the shared folder. As soon as you access the shared folder, it will be synced to your desktop – if you’re on a Mac, it will sync to a new folder in your ‘Documents’ folder. It isn’t ideal but this folder has to stay in this location in which it is created AND MUST NOT BE EDITED OR ADDED TO!!! This is because in order for you to be able to sync the folder to your desktop I have to enable you to access AND modify it. I’m pretty sure better permission controls will come along before long so that I’ll be able to let you access but not modify folders but, for now, please don’t change, move, delete or add to this folder, as it will change the folder for everyone else as well and will get very confusing. For this reason, please install Sugarsync on your personal computer rather than any shared work one that you might use, in order to minimize this risk (you can still access Club sounds via the internet on shared computers). However, having said that, I do have backups should any accidents happen and Sugarsync has quite a good ‘undo delete’ system, so it’s not quite as precarious as it sounds. As is often the way, there are workarounds to these slight flaws: If it’s a bit of a pain having to go into your ‘Documents’ folder to access the sounds then you can, of course, create an alias of the folder in a more easily accessible location. However, for now, it’s probably a good thing that the sync folder is tucked out of the way because you’re then perhaps less likely to accidentally edit it. In my opinion, it’s maybe best to create a new ‘The Sound Collectors’ Club’ folder in your sound fx library then create new folders within that for all the sets that you have access to. Once you’ve done that you can just use the sync folder in ‘Documents’ to copy new audio to your sound fx library from whenever I tweet that new sounds have been added to the collection. Please let me know of any other non-destructive workflows you devise to incorporate the Club’s collection into your sound fx library. So that’s the downloading taken care of! As for the uploading, we’ll stick with the existing system via Soundcloud for now – I don’t want to throw too many new systems at you all at once so I’ll probably hold fire with any new uploading instructions until the New Year. I’ll gradually start adding step-by-step instructions or even a tutorial vid to the website to explain the new process (as well as gradually sharing all the other collections) but hopefully, for now, this post will suffice in pointing you in the right direction towards setting up your Sugarsync account then syncing collections to your desktop. Obviously give me a shout if you have any problems. However this system ends up being adapted to suit our needs, I really feel this type of cloud sharing is the future for the Club so do please give it a go. I think the ideal scenario would be for all Club members to have a dedicated folder (which they can’t erase) somewhere useful on their computer (such as in their fx library or in their menu bar like Dropbox) which auto-syncs whenever new sounds are added to the collection so that you only need to drag and drop them into Soundminer / Audiofinder / etc. from time to time. Sugarsync may just be the first but vital stepping stone towards that goal – please let me know how you get on with it. This entry was posted on November 22, 2011 by sonicskepsi. It was filed under Notices, Themes and was tagged with cloud, guide, how, instructions, Night and Day, Notice, Notices, share, sugarsync, Themes, upload.